For some time there has been a community managed set of Helm Charts to install applications into Kubernetes. These have been a popular way to get up and going with applications in Kubernetes. These charts have been created and maintained by many in the Kubernetes community. While many people have created then and helped managed them, only a handful of people have been able to merge changes to them. Until now. The community charts repository is now setup so that Chart maintainers can get access to merge changes to their charts. 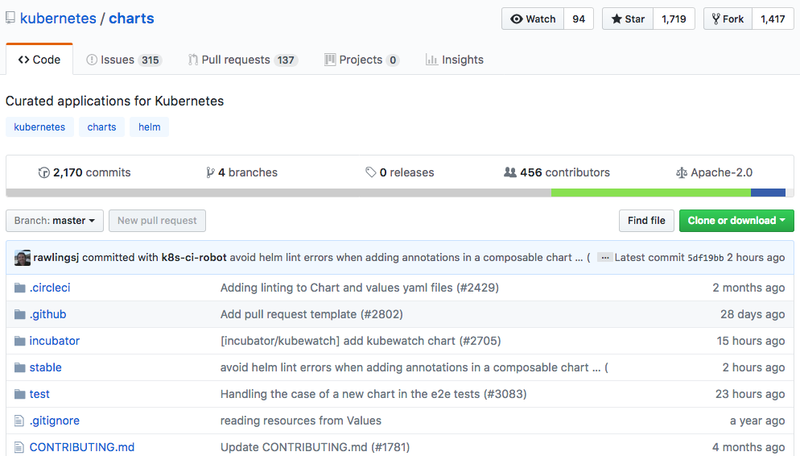 The community charts live in a Git repository at https://github.com/kubernetes/charts. We've now instituted the use of OWNERS files for this repository. That means an OWNERS file can be placed inside a chart outlining who can approve (merge) changes and who can review changes as well as be notified to review a pull request. If you're unfamiliar with OWNERS files, I wrote a recent blog post outlining how they work. In addition to that, there are guides on how to become an owner and how to review charts. Behind the scenes, it appeared we had hit a ceiling in the amount of pull requests we could merge in a given week. Much of the problem was about scaling people to do the reviews. To enable more people to review and approve changes we instituted OWNERS files. This will distribute the load and let the people closest to individual charts manage them. The charts repository owners will still be involved in reviewing and approving changes. It's not that we are going away. Instead, we want to help more people be more involved.